We are located in Westbury, Long Island where you can go to hear and be heard. This is the Caring and Healing Circle. Only Caregivers allowed . You will be welcome, be invited to share, and you will be amazed to discover that everyone in the Circle understands what you’re going through. You may never have been in a place like this before! Caring For The Caregiver has been serving Long Island’s Caregivers for over 10 years! We operate through charitable grants from organizations and individuals who like what we’re trying to do. Working with local organizations and church groups, we invite all the members of the community to the Caregiver’s Fair. We’ve had 8 such events over the last 3 years. In April, 2010, we had 82 attendees to our first Caregiver’s Fair at St. Bede’s Episcopal Church in Syosset, NY. The excitement was tremendous, the evaluations were overwhelmingly positive, and many Caregivers left with a new awareness of their life choices, and a copy of the Caregiver’s Bill of Rights. Since then we’ve had a second Caregivers’ Fair in Syosset, plus additional programs in Massapequa, Smithtown, East Setauket. In January 2012, our biggest ever program attracted 126 people to Winthrop Hosptal in Mineola. 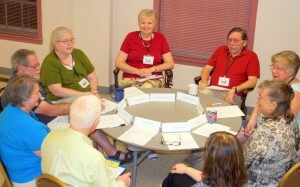 Here local caregivers meet for an afternoon or evening to discuss their care-giving experiences. Caregivers discover that they can discuss and be understood about issues they could express at no other place. Admission to the group is restricted to caregivers only. And even the trained facilitator must have been or be a Caregiver. At the end of the meeting, members are encouraged to consider or take an action, and report back at the next meeting. Over time, the group members are empowered – they move slowly from being victims of their own generosity to taking care of their own well-being while they develop skill and efficiency as Caregivers. Click here to see: Caring Circle Meetings schedule and locations. Click here for Actual Progress of Caregivers Attending the Caregiver’s Fairs and Healing Circle. How you can help or participate. If you are part of a religious or social community, would you like to help us bring our program to your location? Our program, as set out above, takes about 3 months in the preparation. There is a significant cost to the advertising, promotion, and staff cost to create this event. However, we have some limited funding we can contribute. We have a clear timeline and activity calendar to produce the Caregiver’s Fair event; and we can provide training for the Caring Circle Facilitation group to manage the support group going forward. Please call or email us if you’d like to explore further.